*Kaspersky Security Center enables centralised control of most Kaspersky technologies within Kaspersky TOTAL Security for Business, with the exception of Kaspersky Security for Internet Gateway, Kaspersky Security for Mail Server and Kaspersky Security for Collaboration. With a combination of signature-based, heuristic and cloud-assisted anti-malware technologies, Kaspersky TOTAL Security for Business protects against known and emerging threats. Kaspersky helps businesses to secure a wider range of systems. Kaspersky TOTAL Security for Business provides anti-malware protection for Mac, Linux and Windows platforms – and is fully compatible with Microsoft’s new Windows 8 operating system. To help ensure your business is protected against zero-day threats, Kaspersky delivers malware database updates much more frequently than many other anti-malware vendors. Kaspersky’s pattern-based signatures offer improved detection, while also ensuring smaller update files – so your business benefits from effective protection that places less load on your systems. Kaspersky continually updates its Urgent Detection System database – adding data about the latest malware discoveries – so your systems can be protected against new threats, prior to the release of a new malware signature. When an application launches on one of your systems, Kaspersky’s System Watcher will automatically monitor the application’s behaviour. When System Watcher detects suspicious behaviour within an application, Kaspersky TOTAL Security for Business will block the application. Kaspersky TOTAL Security for Business includes our Active Disinfection technology – which works at the lowest levels of a computer’s operating system, in order to protect against malicious code. Millions of Kaspersky customers have opted in to let the cloud-based Kaspersky Security Network (KSN) collect information about suspicious behaviour or malware that’s present on their computers. With this real-time data from the field, Kaspersky is able to provide all customers with a rapid response to new malware – and reduce the likelihood of ‘false positives’. In third-party tests, the Kaspersky Security Network has been assessed as being able to respond to new threats in as little as 0.02 seconds. Kaspersky TOTAL Security for Business includes our Host-based Intrusion Prevention System (HIPS) and personal firewall. Easy-to-use tools give you flexible control over inbound and outbound traffic – enabling you to set up parameters for an individual port, IP address or application. Kaspersky TOTAL Security for Business includes Kaspersky’s Network Attack Blocker technology – to detect and monitor suspicious activity that occurs on your network. You can preconfigure how your systems respond when suspicious behaviour is detected. *Not all features are available on all platforms. Kaspersky TOTAL Security for Business provides anti-malware protection for file servers running Windows, Linux, Novell NetWare or FreeBSD. Kaspersky’s world-class antivirus engine – plus optimised scanning – help to ensure efficient protection, without any significant impact on the performance of your file servers. In addition to protecting cluster servers, Kaspersky’s anti-malware application also protects terminal servers – including Citrix and Microsoft. If one of your file servers develops a fault or is subject to an unplanned shut down, Kaspersky’s anti-malware application will re-launch when your file server restarts. Easy-to-use management tools and reporting features help administrators to reduce the time they need to spend on setting up file server security and producing reports. Kaspersky’s file server security solution is VMware Ready certified. The complexity of the typical business IT environment makes it difficult for administrators to keep track of all of the hardware and software present on their network. However, if a business doesn’t have adequate visibility of every IT asset, how can it apply the necessary controls and protection across every element of its network? Kaspersky TOTAL Security for Business automatically discovers all devices and software on the corporate network – and then records them within hardware and software inventories. With this level of visibility – of all of your hardware and software assets – it’s far easier for you to determine the security status of each of your systems and make sure you apply the relevant security settings. Furthermore, because the software inventory includes information about licences and expiry dates, Kaspersky TOTAL Security for Business helps to enable centralised licence provisioning and helps you to track breaches of licence conditions. Kaspersky TOTAL Security for Business can automatically scan your corporate network in order to identify any unpatched vulnerabilities within applications or operating systems. It works with the Microsoft WSUS database and Kaspersky’s own database of application and operating system vulnerabilities. Kaspersky TOTAL Security for Business can regularly synchronise data on Microsoft updates and hotfixes and apply them to your systems. For many non-Microsoft applications, information about new patches is downloaded from Kaspersky’s servers. By automating the creation and cloning of computer images, Kaspersky TOTAL Security for Business helps to save you time and optimise operating system deployment. Computer images are stored in a special inventory – ready for access during deployment. Kaspersky TOTAL Security for Business helps to simplify the process of distributing applications. It enables administrators to deploy software on command or to schedule deployment for after working hours. Furthermore, the software deployment process is transparent to users. Kaspersky TOTAL Security for Business can remotely access any computer on your corporate network – to help you resolve problems more rapidly. When you’re tasked with deploying new or upgraded software at a remote office, Kaspersky technology lets you use one local workstation as the update agent for the entire remote site – to help reduce the amount of traffic on your network. Kaspersky TOTAL Security for Business helps you to control admission to your corporate network – to reduce the likelihood of dangerous malware gaining access to your systems. Because Kaspersky TOTAL Security for Business automatically discovers devices, you can easily block visitors’ devices from your network and check to ensure employees’ devices are complying with your security policies. It’s also easy to set up a ‘Captive Portal’ – to give visitors access to the Internet, without giving them access to your corporate data. By using an AES encryption algorithm with 256 bits of key length, Kaspersky TOTAL Security for Business enables strong encryption of precious corporate data. Kaspersky TOTAL Security for Business offers both full disk encryption (FDE) and file-level encryption (FLE). FDE operates on the physical sectors of the disk – for encryption that’s ‘close to the hardware’. FDE is an extremely useful way of delivering an ‘encrypt everything at once’ approach. By contrast, FLE lets administrators encrypt individual files – which helps to enable secure sharing of data across the corporate network. For a system’s internal hard drive, Kaspersky TOTAL Security for Business lets administrators use a combination of FLE and FDE. In this way, the entire hard drive can be encrypted – while individually encrypted files can be securely shared across the business’s local network. For a group of computers, the administrator can apply FDE to each computer’s hard disk – while also using FLE on any removable storage devices. This ensures that data on the computer is protected by encryption – and data that’s held on removable drives is also encrypted, so that it can be securely used outside the corporate network. Although many other encryption products are not integrated within a comprehensive endpoint security solution, the encryption technologies within Kaspersky TOTAL Security for Business have been developed as part of the same unified codebase as other Kaspersky protection technologies. By developing all of its primary technologies in-house, Kaspersky ensures a level of integration that means administrators can apply encryption settings under the same policy as anti-malware protection, endpoint controls and other Kaspersky security settings. With Kaspersky TOTAL Security for Business, all encryption and decryption tasks are performed ‘on the fly’ – and non-encrypted versions of encrypted data are never present on a system’s hard drive. In addition, because the encryption and decryption processes are transparent to users, productivity is unaffected by encryption or decryption. When administrators run file-level encryption, application privilege control makes it easy to set clear data access encryption rules for specific applications and usage scenarios. With flexible settings, administrators can control whether a specific application is blocked from accessing the encrypted data, allowed access to the data in its encrypted form or is able to access unencrypted data. The decryption process is transparent to the application. Application privilege control makes it easy to create secure backups, by ensuring encrypted data remains encrypted during transfer, storage and restoration – regardless of the policy settings at the endpoint where the data is restored. Furthermore, application privilege control can block the exchange of encrypted files via Instant Messaging (IM) or Skype – without affecting the legitimate use of IM or Skype. With Kaspersky TOTAL Security for Business, users are able to create password-protected, encrypted, self-extracting packages of files and folders. This helps to ensure that sensitive data can be securely transferred and shared – via email, the web or a removable device. In the event of one of your systems suffering a hardware or software fault, a device-unique key – that is held in escrow within Kaspersky Security Center – enables you to decrypt data that’s stored on the failed system. Even if the operating system is unable to boot, administrators will be able to access the encrypted data. If a user forgets or loses their password, a challenge / response mechanism allows the recovery of the pre-boot password. Kaspersky TOTAL Security for Business includes a combination of signature-based, proactive and cloud-assisted anti-malware technologies – to protect a wide range of mobile devices against today’s sophisticated malware. With updates delivered from the cloud-based Kaspersky Security Network, Kaspersky helps to defend your mobile devices against the very latest threats. 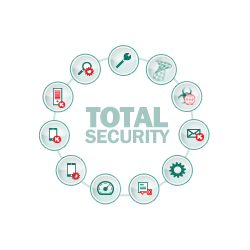 Kaspersky’s Application Control features make it easy to manage which applications are able to launch on the mobile devices that have been granted access to your network. Administrators can implement a ‘default allow’ policy – that blocks blacklisted applications but allows all other applications to run – or a ‘default deny’ policy that only allows whitelisted applications to run. Kaspersky TOTAL Security for Business can also detect jailbreak or rooting incidents. Kaspersky TOTAL Security for Business lets administrators encrypt any corporate data that’s stored within mobile devices – to help prevent corporate data falling into the wrong hands. Individual files or folders can be encrypted, using file / folder level encryption (FLE). For iOS devices, administrators can encrypt an entire disk or a partition. Kaspersky TOTAL Security for Business includes containerisation technologies that enable administrators to set up a separate container within a user’s own mobile device. This allows corporate data to be held within the container – so that sensitive corporate information is separated from the user’s personal data. The contents of the container can also be automatically encrypted. In addition, administrators are able to manage whether individual applications are able to access specific resources within the device. Containerisation provides an additional level of security for businesses that are running a Bring Your Own Device (BYOD) initiative. In the event of a mobile device being stolen or lost, Kaspersky TOTAL Security for Business includes special, remotely-operated features that let administrators lock the device, delete any corporate data that’s stored on it and find the device’s approximate location. Even if a thief fits a new SIM to the device, Kaspersky’s SIM Watch technology can automatically send you the device’s new number – so you can then remotely run the lock, find and data wipe functions. **Only available for mobile platforms specified on the Kaspersky list of supported platforms. Not all features are available for some of the supported mobile platforms. Kaspersky TOTAL Security for Business delivers efficient mobile device management (MDM) functionality – including support for Active Directory, Microsoft Exchange ActiveSync and Apple MDM Server. Kaspersky’s extensive MDM capabilities make it easy for administrators to deploy Kaspersky’s mobile security agent and control mobile apps and OS. The security agent can be delivered to devices over the air or via a tether. Administrators can easily monitor which users’ devices have completed the necessary security download, and can ensure that unprotected devices are blocked from accessing the corporate network. ***Only available for mobile platforms specified on the Kaspersky list of supported platforms. Not all features are available for some of the supported mobile platforms. Kaspersky is the only security vendor that runs its own Whitelist Lab. The lab’s dynamic whitelisting service assesses the security of commonly used applications – and ensures they’re safe to run. Whitelist updates are then delivered to your systems from the cloud-enabled Kaspersky Security Network – so your business gets rapid access to Kaspersky’s latest whitelist information. With flexible Web Control functionality, Kaspersky TOTAL Security for Business helps administrators to prevent the corporate network being used to access inappropriate websites. Web Control makes it easy to monitor and filter each employee’s web browser usage. Administrators can permit, prohibit, limit or audit users’ access to specific websites or categories of websites – including games websites, gambling websites or social networks. Kaspersky’s mail server protection technologies defend mail traffic and groupware servers from malicious programs and spam. In addition to supporting a wide range of mail servers – including Microsoft Exchange, IBM Lotus Notes / Domino, Sendmail, qmail, Postfix, Exim and CommuniGate Pro – Kaspersky’s mail server solution can also be used to set up a dedicated mail gateway. Flexible, easy-to-use management tools give you efficient control over all aspects of Kaspersky’s mail server protection technologies – including managing scan settings, monitoring protection status and generating reports. Frequent, automatic database updates ensure you have Kaspersky’s latest protection against malware and spam. In addition to optimised virus scanning and the ability to exclude specific items from scans, Kaspersky’s mail server protection also supports load balancing of server resources – so you benefit from high performance protection, without placing a significant load on your computing resources. Furthermore, intelligent spam filtering helps to reduce the amount of traffic on your network. Kaspersky Security for Mail Server is VMware Ready certified and has a proven track record of protecting virtual environments. Kaspersky TOTAL Security for Business provides protection for traffic flowing through most popular Windows-based or Linux-based gateways. It automatically removes malicious and potentially hostile programs that appear in your HTTP(S), FTP, SMTP and POP3 traffic. Kaspersky’s frequent database updates help to ensure you’re protected against the very latest and emerging threats. Kaspersky TOTAL Security for Business can also protect corporate mail flowing through Microsoft Forefront TMG or Microsoft ISA Server. Optimised, intelligent anti-malware scanning – plus load balancing – help to deliver high detection rates, without placing a significant load on your systems. Simple management tools and flexible reporting give you improved control and visibility of your security. Kaspersky TOTAL Security for Business offers effective anti-malware protection, content filtering and file filtering for Microsoft SharePoint platforms. An intuitive-to-use interface simplifies management tasks – so you can centrally manage the protection of an entire SharePoint server farm, from a single console. Content filtering and file filtering capabilities help to support your document storage policies and eliminate the storage of unnecessary files – so you can make more efficient use of your existing storage capacity. Kaspersky’s protection technologies also have very little impact on the performance of your systems. Content filtering capabilities help to control and assign internal collaboration policies – by checking all documents against lists of prohibited content, such as offensive language or explicit words. Pre-installed dictionaries / categories make it easy to set up filtering – and administrators can also create their own lists of prohibited words. A clear dashboard display gives you real-time access to key information – including IT security status, database version and licence status for all protected servers. Flexible reporting also provides you with an overview of events and protection status. Kaspersky TOTAL Security for Business includes Kaspersky Security Center – the centralised management console that simplifies the management of most Kaspersky security technologies and Kaspersky systems management functions2. With Kaspersky Security Center, you’re no longer faced with having to learn how to use several different management consoles in order to manage each different category of security and systems management task. 2 Kaspersky Security Center enables centralised control of most Kaspersky technologies within Kaspersky TOTAL Security for Business, with the exception of Kaspersky Security for Internet Gateway, Kaspersky Security for Mail Server and Kaspersky Security for Collaboration. View system requirements for each application by clicking on the item in the application list above.